With the growing distribution of GPS devices and tools such as Google Earth or GeoPosition it is easy to determine the geographical coordinates of interesting points on the earth's surface. This article shows how to determine the exact linear distance between two points using their coordinates. The Earth's surface resembles the surface of a sphere. Each point on the earth's surface can thus be uniquely described by two coordinates: latitude and longitude. 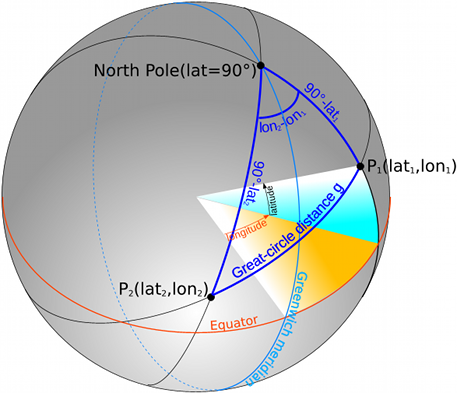 The latitude (abbreviated: lat) describes the angle that spans itself between the center of the earth, the searched point P and the equator (blue area in Fig. 1). Points on the equator have always a latitude of 0, while the north pole has a latitude of 90 degrees and the south pole -90 degrees. The curve that passes through points of equal latitude, is called circle of latitude or parallel. 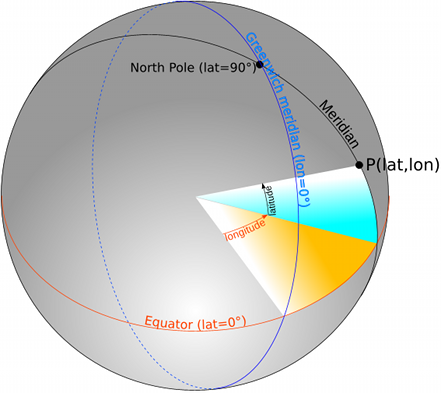 The longitude (abbreviated: lon) is the angle between the center of the earth, the searched point P and the prime meridian (yellow area in Fig. 1). A meridian passes through the North Pole, South Pole and all points of equal longitude. The meridian that runs through the old Greenwich Observatory was arbitrarily assigned a value of 0, making it the prime meridian or Greenwich meridian. Points east of Greenwich have a longitude between 0 and 180 degrees and points west of it from 0 to -180 degrees. The meridians -180 and 180 degrees are identical and represent virtually the extension of the prime meridian. 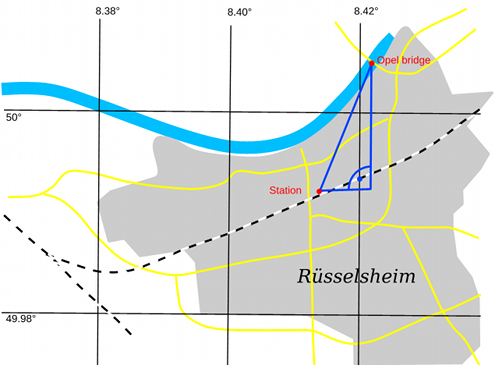 First, the distance between Rüsselsheim station and Opel bridge is to be determined. 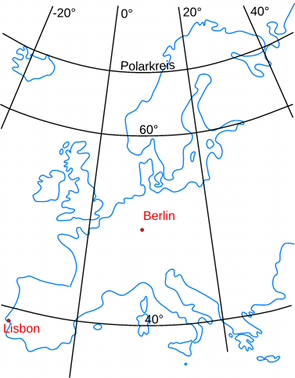 The simplest approach is to take a map of Rüsselsheim with marked lines of latitude and langitude (Fig. 2). When specifying the length and width in degrees, there is the distance in kilometers. The constant 111.3 is the distance between two circles of latitude in km and 71.5 is the average distance between two meridians in our latitudes. This can be incorporated into the calculation formula. The value of lat is chosen from the average of lat1 and lat2. The parallels and meridians do no longer form a rectangular grid here. This is due to the spherical shape of the earth. But it is impossible to unroll a spherical surface into a plane without distortions. While one can ignore the distortion on small areas such as a street map, a map of Europe can no longer produced in this way. You have to use here methods of spherical trigonometry and take into account the definition of latitude and longitude from above. Fig. 4 shows again the earth as sphere, but now with two marked points P1 and P2, whose distance is to be determined. This (shortest) distance is also called great circle distance. The points P1 and P2 form a spherical triangle together with the North Pole. From this two sides and the angle are known: The length of the side is equal to the distance of the point from the North Pole, so 90 degrees minus its latitude. The included angle is calculated from the difference of the lengths of the two geographical points. The formula applies to the indication of the angle in radians, which is the standard for most programming languages. If we compute with a pocket calculator, which is set to degrees, then we have to use the value 6378.388 * π / 180 = 111.324 instead of 6378.388. On fast PCs the point of cost differences is now much less relevant. But if you have to type in the formulas on the pocket calculator, the time plays a major role. The calculations were performed with a program written in C++ (Sourcecode at GitHub). For short distances, the three variants are practically equivalent of their accuracy. At distances at a European level however, we found great differences, so you should use the exact method with consideration of the spherical surface here. The previous considerations have always assumed that the earth is a sphere. However, this is not the case. Rather it is an irregularly shaped Geoid. It can be approximated with the figure of an Ellipsoid. An ellipsoid is determined by the length of its semi-major axis (the equatorial radius) and semi-minor axis (the polar distances). Unfortunately, there is no simple formula for the ellipsoid analogous to the cosine rule for the sphere. The calculation of distances on the surface of an ellipsoid is much more complicated. Additional there is not only "the one ellipsoid of the earth" but dozens of them. It depends on the location on earth which ellipsoid approximates best the actual surface of the earth. The parameters of this ellipsoid (length of axis and displacement of the center) are often understood by the term "geodetic system" or "geodetic datum". Several hundred different exist. A de facto standardization has been achieved by the spread of global Global Positioning Systems (GPS), which uses the WGS84 reference ellipsoid. The development of a tool for accurate distance determination for all kinds of ellipsoids and geodetic datums is therefore complex matter. Luckily, such tools already exist. In this article is PROJ.4 - Cartographic Projections Library the tool of choice. Proj.4 is completely available as source code and binary distributions for Linux and Windows. There is also the Java Map Projection Library which is a partial port of Proj.4 to Java. The last value of the output is then the distance in kilometers. The calculatation uses the WGS84 ellipsoid, i.e. the input coordinates have to be determined in the WGS84 system. For the original GPS coordinates that is always the case. In reviewing the examples from above the result for the short distance in Rüsselsheim is again 1.593 km. The distance Berlin - Lisbon is now calculated with 2318.217 km. The exact method with the sphere triangle is therefore next to approximately 500 meters. This means in relation to the distance just an error of 0.02%. The simplified methods of plane trigonometry are sufficient to determine short distances. However, a shortcoming of the formulas given is the need to have to be multiplied by the "odd" values for the distances between the parallels and meridians. In addition, the distances between the meridians are not constant. It would be much easier if you could use coordinates that do not have these disadvantages and can be directly converted into distances. Such coordinate systems already exist. The most common are the Gauss-Krüger coordinate system in Europe and the Universal Transverse Mercator coordinate system (UTM) world-wide. Both coordinate systems allow to map small regions of the earth's surface into a plane, so that they can be overlaid with a rectangular coordinate system. These coordinates are then no longer measured in degrees, but in meters. Instead of latitude and longitude they usually bear the name Northing and Easting. Since the coordinates are in meters and are in the same UTM zone, one can calculate the distance immediately with the Pythagorean theorem and the result is again the known value of 1.593 km.